1. Who can candidate to the Chateaubriand fellowships? The Chateaubriand fellowships of the French Embassy include all fields of research (Exact and life Sciences, Medicine, Humanities and Social Sciences). They aim to support Israeli Ph.D. students for a period of 1 full year in France, beginning on October 1st (age limited to 35 years old*) and for Israeli researchers and Professors - to conduct research in France for a period of 1 to 6 months (no age limit). 2. I would like to do a Master in France. Can I apply to the Chateaubriand fellowships? No. Only Ph.D. students or Israeli researchers and Professors can apply. 3. By the end of the academic year, I will get my master degree and would like to apply for a Ph.D Chateaubriand fellowship. Am I eligible? 4. I applied last year for a Chateaubriand fellowship but was not selected. Can I apply to your program again? Yes, as far as you can provide an up-to-date invitation letter, up-to-date project descrition and up-to-date CV (incuding the list of publications) + if you apply for a PhD fellowship, 2 new recommendations letters with the date of today. 5. I am not an Israeli citizen but live in Israel. Can I apply to your program ? 6. Is there an age limit to apply to the fellowships? * PLEASE PAY ATTENTION THAT THE AGE CALCULATION IS DONE ON OCTOBER 1st, 2019, which is the date of departure to France. 7. I am married and I have children. Can I apply to your program? Yes, every Ph.D. student or scientist is welcomed to apply. 8. I have a French-Israeli dual citizenship. Am I allowed to apply for the Chateaubriand fellowships? No. You are not eligible to apply if you have a French-Israeli dual citizenship. 9. I don’t speak French. Will it be a barrier to my application? No, the ability to speak French is not a selection criterion. Nevertheless, it is preferable to learn French before your departure. Learning French saves time and is an excellent way to get prepared for your stay in France. 10. I am currently doing my studies in France. Can I apply for the Chateaubriand fellowships? if you are doing a dual diploma (PhD), you have to be registered as well in an Israeli university. 11. I started my Ph.D in a French laboratory last year. Can I apply to fund my 2nd year? 12. I started my Post doctorate in a French laboratory last year. Can I apply to fund my 2nd year? No, you can apply for a Chateaubriand fellowships only if you have a valid employment contract in Israel or a Post-doc felowship in Israel. 13. I want to apply for a PhD fellowships and am no longer registered in an Israeli university. Can I apply? Yes. However, if you are doing a dual diploma (PhD), you have to be registered as well in an Israeli university OR you have to hold an Israeli Master degree. 14. Who needs to write the invitation letter? The invitation letter has to be written by the French institution that is willing to host you. 15. Who can I contact if I still have questions regarding the application procedure or specific questions regarding the Chateaubriand fellowships ? We recommend you first of all to read carefully the FAQ (where you could find more than 40 questions in diverse subjects) and then if you still have questions, you are welcomed to send an e-mail to contact@ambfr-il.org. 16. Is there a Facebook Page with updates about the Chateaubriand fellowships status ? 17. What are the selection criteria? - Interest of the project for the French-Israeli scientific cooperation over the long term. 18. Who sits on the jury? The jury is composed of Israeli and /or French university Professors under the chairman of the Scientific and Academic Attaché. The jury is revised every year depending on the leading science fields that appear in the application forms. Required documents - All documents must be in English, documents in Hebrew (and in French) will not be accepted. 19. I will not be able to provide my Ph.D. diploma before the deadline of the shorlarship. Can I enclose any other document proving that I will finish it in time? Yes. You can upload a document attesting that you have finished all your studies duties for your PhD diploma and indicating the approximate date you will get it. You will upload them in the Other documents section (up to 3 documents). 20. Can you help me to find a position in a French university? You have to contact a French laboratory or a French university by yourself. 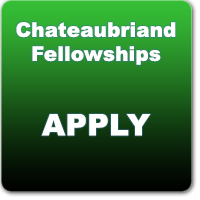 Before applying for the Chateaubriand fellowships, you must contact the host institution to secure a position. 21. Do I need to upload the grade sheets of my B.A? Only grades of the highest diploma are required. So, if you apply for a PhD you should upload your Master. If you apply as a researcher or as a Professor, no diploma is required and of course no grade sheets as well. 22. Is it mandatory to provide 2 recommendation letters? Yes, we need 2 recommendation letters but they should not come from your French hosting institution. The recommendation letters are needed only if you apply to do a Ph.D. If you apply as a researcher or as a Professor, there is no need to provide recommendation letters. 23. Will you accept a recommendation letter from my host institution in France? No, we need 2 recommendation letters but not from your hosting institution. 24. Who needs to upload the 2 recommendation letters ? Please pay attention that the recommendation/reference letters (in English only) should not come from your French hosting Institution (but can come from any country). Either you can uplod the reference letters by yourself in STEP 2, either you can ask your referring teachers to send them to our System Manager : Fabien Serna Ostrowsky at fabien@hashkey-services.com. 25. What do you mean by an invitation letter from the French hosting institution? A letter of agreement of about 1 page, explaining briefly their support for your application to carry out a research in their institution. The equipment that will be provided at your disposal and the team support also need to appear in the letter. 26. What should be in the cover letter? The cover letter should explain why your collaboration with France is important and how it will lead to future long-term collaboration between the two countries (French-Israeli publication, mobility of doctorates from the 2 countries, bi-national symposium, etc…). The cover letter needs also to emphasize the fact that your willingness to conduct research in France is not only an individual project but involves research institutions from France and Israel that already cooperated in the past or that are in the middle of launching a scientific and academic collaboration. In addition to that, the cover letter should not enter too much into scientific details as the jury is composed by reviewers from diverse disciplines who are not always familiar with your research area. 27. How long should be the cover letter ? The cover letter should be between 1 to 2 page(s) maximum. 28. Can I apply for a shorter period? The Chateaubriand fellowships for Ph.D students are long-term grants of 1 full year of stay in France. However, if you apply in order to pursue research in France (as a researcher or as a Professor), you need to choose for how long you wish to stay in France: from 1 to 6 months maximum and indicate the exact period you would like to be in France. 29. I apply as Ph.D student and would like to begin my study, or to leave Israel, before October, 1st. Can I apply to your program? Yes, you can arrive in France before October, if you have met all of your obligations towards the French Embassy and if you have long stay visa for France. However, you will not get any financial support before October,1st. 30. I apply as PH.D. student and would like to begin my study in France after October,1st. Can I apply to your program? It is not recommended, but in special/personnal reasons cases, we can allow our fellows to arrive in France after October, 1st, but you will not receive any financial compensation if you overstay in France after September 30th, next year. 31. I apply as PH.D. student and during my stay in France, am I allowed to travel to Israel for experimenting purposes or for vacations? Yes, you can come back to Israel for carrying out experiments or for short vacations but only for short period of time and in agreement with your French supervisor. The Chateaubriand Fellowships Program and Campus France will not provide any extra funding for these travel expenses. 32. I apply for doing research or as a researcher or as a professor, and during my stay in France, am I allowed to travel to Israel for experimenting purposes or for vacations? Yes, you can come back to Israel for carrying out experiments or for short vacations but only for short period of time and in agreement with your French host. However don't forget that you get a short term fellowships of only 1 to 6 months and that you may loose precious time when you are away. 33. I would like to travel to France a number of times but not on a continuous work period. Can I apply to your program? 34. Can fellows go on vacation during their say in France (to Israel or to other destinations) ? Only doctoral fellows are allowed to take vacation, however only during university holidays. Regarding researchers (as they anyway get short fellowships), we suggest them to go on vacation before their departure to France. This limitation is motivated in order to allow researchers who get the Chateaubriand fellowships to take advantage of the opportunity they get and to conduct research in France at the full period of their fellowships. 35. Will I get a health insurance or do I have to subscribe by myself? 36. Will my family be covered by the health insurance provided by Campus France? 37. Who can I contact if I have specific questions regarding the health insurance? 38. Do I need to subscribe to a supplementary health insurance in France (mutuelle)? It is up to you to decide according to you personnal situation. 39. Do I need a visa to stay in France? If you plan to stay for 3 months in France or more, you do need a visa. The Consulat Général de France in Tel Aviv http://www.ambafrance-il.org/article9937,9937 or in Jerusalem can provide these official documents. 40. Which kind of visa should I apply for? If you are a Ph.D. student, you will apply for a visa chercheur (visa for scientists and researchers) if your host university provides you a convention d'accueil and otherwise for a visa étudiant . 41. What will be my status? You will have the status of Fellow of the French government (boursier du gouvernement français). 42. How do I apply for a visa? 43. Do I have to pay for this visa? No, a letter from the Scientific Department will allow you to get the visa for free. Family members who will be moving with you have to pay for their own visas. 44. How long before I left for France should I apply for my visa? You may apply for a visa no more than two months and no less than three weeks prior to your departure. Once you have met all of your obligations to the French Embassy and once you have received the convention d’accueil from your host institution (if you are eligible to get it), you may apply for your visa as soon as possible. Take into account that processing of long stay visas takes a minimum of 10 working days. 45. Can I extend my stay in France after the visa expires?